Meathead Movers is here to take care of the heavy lifting for you on your move to Mill Valley. Our clean-cut student athlete movers are ready to get you safely settled into your new Mill Valley home. Welcome to Meathead Movers of Mill Valley! If you are moving to or from anywhere in Mill Valley, we are the moving company for you! Our professionally trained student-athlete movers and our moving concierge service are here to help you with every stage of your move in Mill Valley. Just 14 miles north of San Francisco, Mill Valley is a beautiful suburban area. Nestled on the edge of Mount Tamalpais and extending to beautiful Richardson Bay, Mill Valley has a beautiful and natural charm. Visit Muir Woods National Monument, the Golden Gate National Recreation Area, or any one of Mill Valley’s beautiful parks to enjoy a taste of the outdoors. Appreciate the culture of Mill Valley at any one of Mill Valley’s wide range of cultural activities including, Wine & Gourmet Food Tasting, the Mill Valley Fall Arts Festival, and Winterfest. Mill Valley is also home to a vibrant business district that has everything from unique boutiques, salons, yoga studios, to an excellent selection of restaurants. 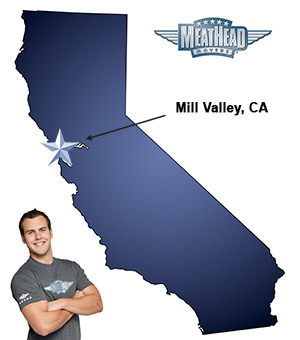 If you are interested in moving to Mill Valley, Meathead Movers is here to help! Our moving company specializes in local, long-distance, and commercial moves to, from, and within Mill Valley. We also provide reliable packing, storage, on-site relocations, and our distinctive moving concierge service. All our student-athlete movers are thoroughly screened and trained before their very first move. With branches not just in Mill Valley, but all throughout California, we are your one-stop resource for all your moving needs, no matter where your California move takes you. In fact, you can see what your neighbors in Mill Valley have to say about us. With our 100% satisfaction guarantee, the only thing you have to lose is the stress that comes from moving! So contact us today for a free moving quote and to learn how we can help you on your next move! View more Mill Valley resources. I really liked the professionalism of the people that came to our house to load the stuff and the person that was in charge. They were polite and professional.